This article is an excerpt from my book, Educate Your Brain. Chapter 12 is titled “Make Lasting Change through Edu-K Balancing,” in which I describe the remarkable Edu-K "balance" process, using this (very true) story. Alexa was a senior in college, majoring in Media Production, with a goal toward working in television or radio. A very right-brained young woman, she’d never done well in certain aspects of academic study, most notably English grammar. She just hated all those punctuation and language rules, and had since childhood. However, Media Production was part of the journalism department, which required an extensive exam in English grammar in order to graduate—and Alexa had already failed it once. Her very thick study guide began feeling bigger and heavier as the days dragged by, and she found more and more reasons not to study. When she did open it, the information just “swam in front of her eyes,” and she couldn’t focus at all. Her feeling of dread was increasing daily. Alexa and I began our balance process with PACE, so we were both operating in a state of clarity and integration, prepared for new learning and in tune with each other. I then supported her in creating her goal: “to easily understand and quickly learn English grammar." She was completely engaged, animated, and comfortable as we came up with this language. I invited Alexa to check her “before” state through various pre-activities, to notice the difference between any parts of her goal that already felt familiar and safe, and where she could see there was room for more learning. Then I suggested that she act out a scene that represented studying for an English exam. How could she do this here in my office? As it happened, my own high-school English grammar text was in a handy bookcase, and I simply pulled it out and set it down in front of her. She took one look and fell back in her chair, uttering a distressed “Aaagggghhhh!” It was obvious: her mind-body system was not happy about studying English grammar. What a vivid experience of her less-than-integrated state! • She could hardly focus to read a page of text. • Her eyes resisted tracking across the lines of print. • Her neck, shoulders, and stomach were unusually tight. • She was barely breathing. • When she did her postural checks, she was quite out of balance in all three dimensions. • She felt anxious, apprehensive, confused, and overwhelmed. All this was evidence of the switched-off state of Alexa’s brain. Of course, she and I were observing these things on the surface, simply noticing how she reacted and how her body moved (or didn’t move). I offered Alexa a learning menu of Brain Gym movements and Edu-K processes and invited her to notice which ones drew her attention. In my experience, this is actually the key point in any Edu-K balance: as “stuck” as a person might feel while immersed in her issue, her awareness is heightened at this point, and the frustration she’s feeling has her mind and body primed and ready to make a change. In this moment, she will find herself drawn to the movements or processes that will most benefit her. This is what makes Edu-K balancing different from many other modalities: the element of personal choice. The facilitator doesn’t choose—the learner does. 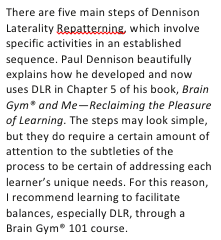 In fact, Alexa’s choice of Dennison Laterality Repatterning (DLR) was not surprising. If a stress reaction were causing her non-leading (left) hemisphere to switch off, it would block her ability to function with details. Going through the steps of DLR would likely help her brain’s two hemispheres come into greater communication—“powering up” all of her abilities—and then leave behind a more efficient pattern of brain organization in relation to her issue. movements became easy and fluid. I could almost see her mind-body system beginning to access new inner resources as she developed these more natural movement patterns. • She could focus on a page of text and read easily. • Her eyes flowed easily across the lines of print. • Her whole body felt relaxed; tension had vanished. • Her breath was deep and full. • Her walking gait was fluid and energetic. • She felt confident—and surprised! I suggested she look again at my old English grammar text. She calmly reached for the book and paged through it a bit, saying things like: “Well, I know that part. . . . Oh, I see what that means. . . . Hmm. This is new, but I think I could figure it out.” She could actually focus on the text now and pay attention to the material. So what had happened to create such change? I think of the balance process as a gentle, profound means of educating your mind-body system about the state in which you want it to operate, for any target activity you care to address. Through balancing, we return to a more whole-brain state and experience all the levels of physical comfort, easy functioning, and positive attitude that accompany it. Taking time to fully notice the difference in how we feel after- ward reinforces our awareness of the change we’ve made. So now when we think about our “issue,” it’s the clarity of an integrated brain organization pattern that emerges. If you would like to experience the balance process, or offer this opportunity to someone you care for, you have some options. • You can work with a Licensed Brain Gym® Instructor/Consultant. Check the Brain Gym website for instructor listings. There are hundreds of instructors available, around the world. 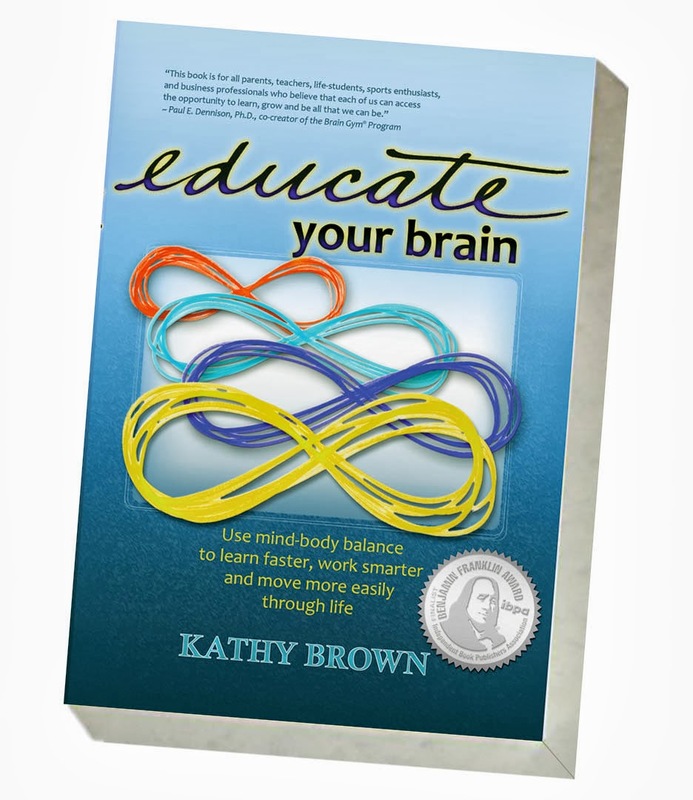 • You can take the Brain Gym® 101 course, and learn to facilitate the balance process yourself - including Dennison Laterality Repatterning. Check the Brain Gym website for course listings. Search for "Level 1", then "101 BG", then your country, state/province, and city. If you're in the Phoenix area (or would like to visit) I have three BG101 courses coming up: March 18-20, July 22-24, and November 11-13, 2016. Click here for course information. Wishing you all the best in your Brain Gym journey! 1 PACE is an acronym for the Brain Gym® warm-up: Positive, Active, Clear, and Energetic. These four activities, Sipping Water, rubbing the Brain Buttons, doing the Cross Crawl, and sitting or standing in the Hook-ups posture, help us release stress and return to our best learning state. 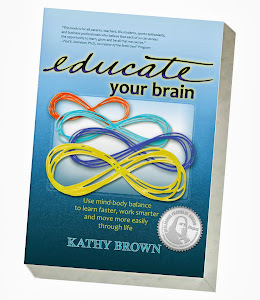 You can learn more about the PACE process in the first section of my book, Educate Your Brain. 2. Brown, Kathy. Educate Your Brain - Use mind-body balance to learn faster, work smarter, and move more easily through life. Phoenix: Balance Point Publishing. 123-126. Copyright© 2015 by Kathy Brown. All rights reserved. Original article Copyright© 2012 by Kathy Brown. All rights reserved.